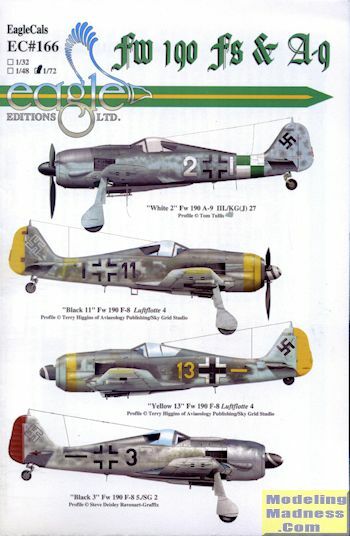 This latest set from EagleCals is the 1/72 sheet for the FW-190F & A-9. The decals are available in 1/48 and 1/32 as well. I'm pleased that the 1/72 sheet was sent as I like to build in this scale and already have a kit or two set aside for this one. 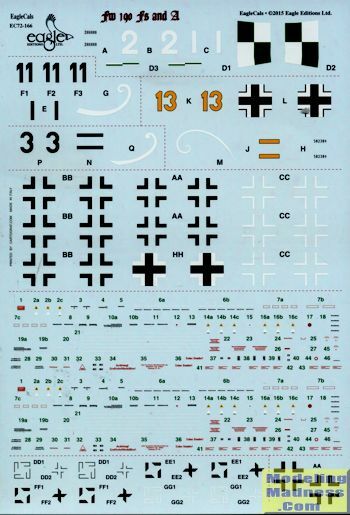 There are four planes on this sheet starting with the lone FW-190A-9. This plane is in the standard scheme of RLM 74/75/76 with light fuselage mottling. It carries the Reich Defense band for KG(J)27. An interesting note is that apparently the 14 blade engine fan caused a drop in performance and so was not always fit to the A-9 variant. However, it did have the larger prop blades. Next is the first of three FW-190F-8s. These ground attack planes had the outer guns deleted and two bomb racks on each wing in its place. This one was with Luftflotte 4 late in the ware and sports the yellow rudder and a wider than usual yellow nose band. It also has a yellow fuselage band and lower wing tips though the fuselage band is partly overpainted. Standard camo with areas of light green on the wings and RLM 82 fuselage mottling. Yellow 13 is from II./SG 10 and also in standard camo. The rudder, cowl band and lower wing tips are in a dull yellow that could have been lightly oversprayed with some other color. This aircraft has the early canopy while the rest have the later 'blown' version. Finally, we have Black 3 from 5./SG2 at the end of the war. Most of this plane is in natural metal with the some RLM 74/75 on the upper wings and fuselage. Unpainted rudder and elevators still in primer. This aircraft has an interesting story behind it. You get a great set of instructions with full data placement instructions and detailed information on each subject. There are enough insignia and common markings to build three of the four subjects. The swastikas are in sections so the sheet can be sold overseas. Note that the sheet is a bit dark so the white would show up better. The fuselage band really is white and green. Thanks to EagleCals for the review sheet. Available in all major scales. Get yours at this link.